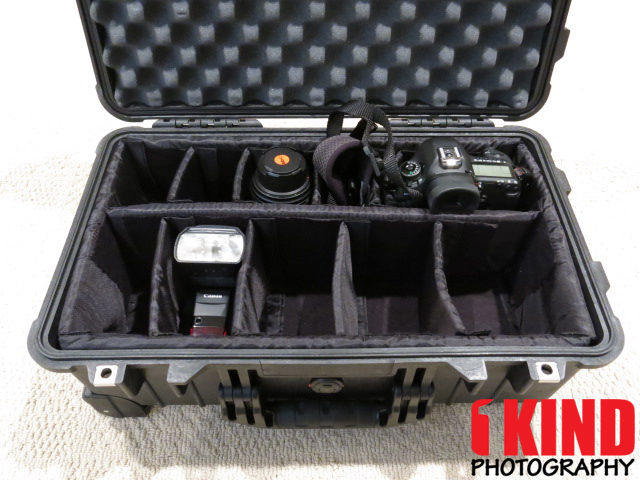 Overview : The Pelican 1514 camera case offers an interior storage area of 19.75" X 11.00" X 7.60". 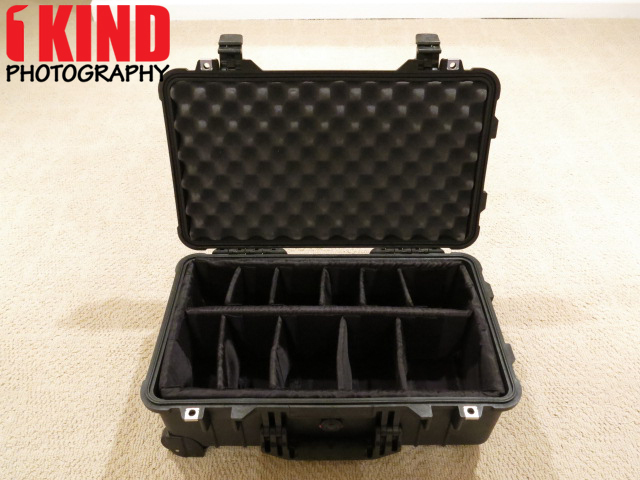 This case comes complete a padded divider set that allows you to configure and organize small and large items within the case. This divider set is made from ballistic nylon and are padded and flexible. Velcro fastener on the edges that are used to attach the dividers to the tray or other dividers. 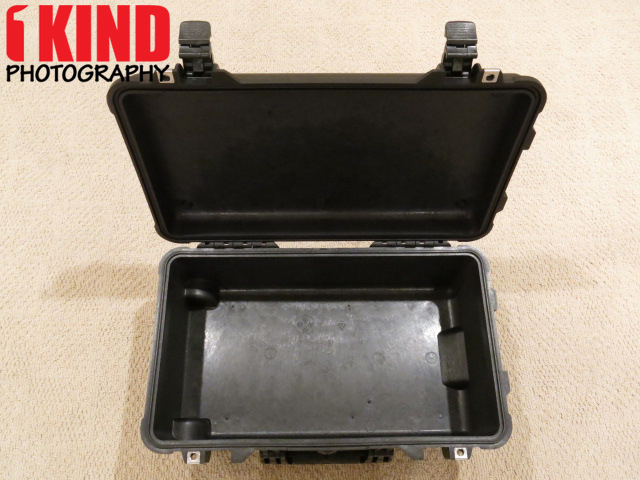 In addition, this Pelican case features built in wheels with stainless steel bearings and a retractable handle to make transporting a breeze. This case meets FAA carry-on approval specification. Ext. Dim. : 22.00" X 13.91" X 9.00"
Int. Dim. 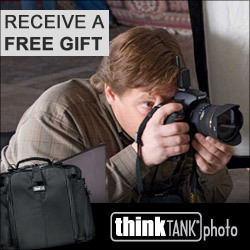 : 19.75" X 11.00" X 7.60"
Lid/Case Depth: 1.79" / 5.79"
Quality/Usability : Protecting your camera is a must since you invested so much money into your gear and depending what you do for a living, it brings in income. 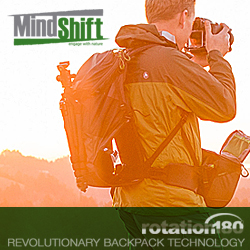 I've gone on trips with my gear in a shoulder bag or backpack. Although it hauled what I needed, there wasn't much protection from accidental bumps. 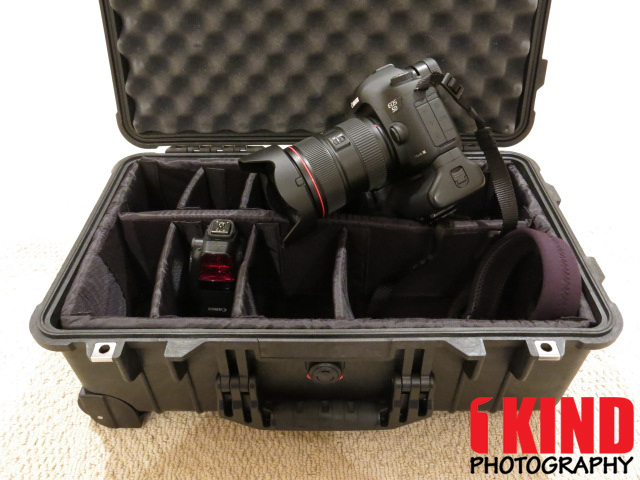 Pelican is well known when it comes to protecting your gear whether it be cameras, firearms, laptops or just fragile and/or expensive equipment in general. 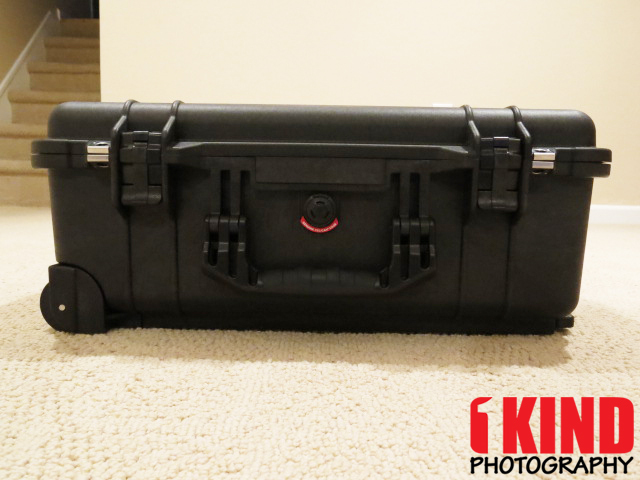 Professional photographers, big name movie studios, government agencies and other departments use Pelican cases to haul their gear. Pelican cases are made of high impact structural Copolymer Polypropylene, they are nearly indestructible, watertight, dustproof and guaranteed for life. The case weighs about 15lbs. without any gear. So it has some weight to it but that's something you'll have to sacrifice if you want protection. As I mentioned above, I go on trips so looking for a case that is FAA approved carry-on is a must. I'm sure you've heard of lost luggages, expensive jewelry stolen or big wads of money (you should be carrying that on you anyways), or just luggages being chucked around on the tarmac. So I would never check my bag in especially with gear valued over $10,000 or more. 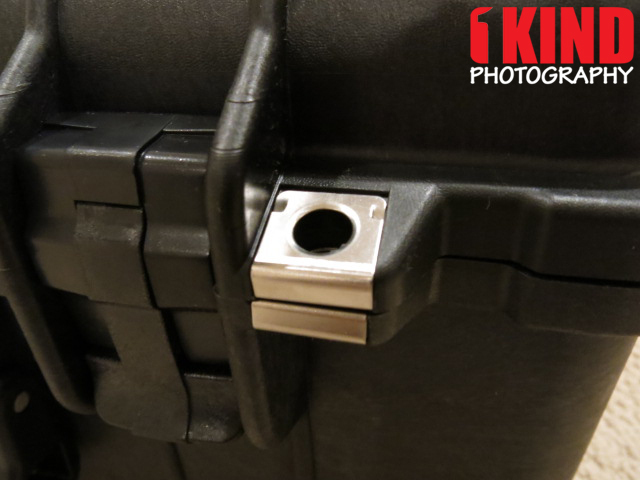 To be able to lift the handle up, there is a small pull tab locking mechanism. Simply pull back on it and lift the hand out of from the back. Once the handle is fully up, the locking mechanism will lock in place. To put the handle back down, simply pull back on the locking mechanism again and push the handle down until it locks in place. One thing I would like to see is the ability to be able to lock the height rather than all the way up. If there was another 1-2 notches somewhere on the handle, this would be helpful since everyone is not the same height. It would be nice if the handle can be better supported for when I want to sit on the case in the vertical position and I want to lean on the handle when its up. Like with all hard cases that is used in extreme conditions, there is a pressure equalizer. This allows the free passage of gases and vapors, equalizing the pressure differential between the enclosure and surrounding area. 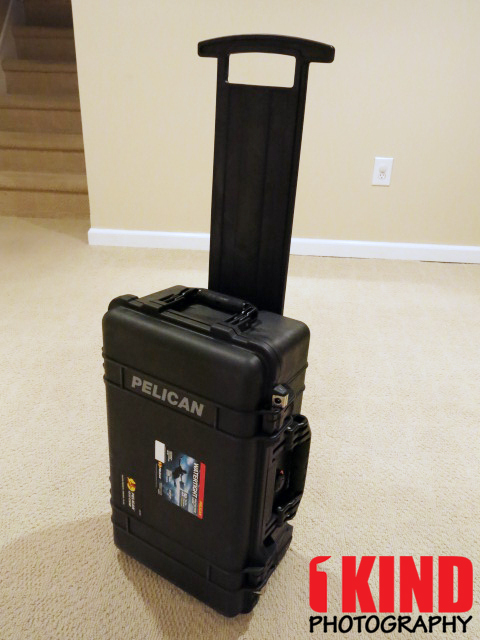 The Pelican lid locks hold a tight grip and keeps the case close. There's not additional steps or safety measures. Simply just lift up and the case can be opened. On both ends of the case and next to the lid locks is a spot for you to place a lock to add additional security from anyone breaking in. 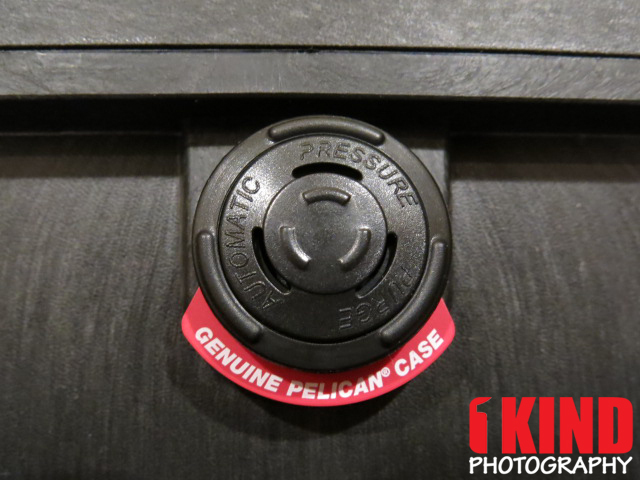 Pelican added metal cutouts around the hole to prevent someone from cutting or breaking through the case. 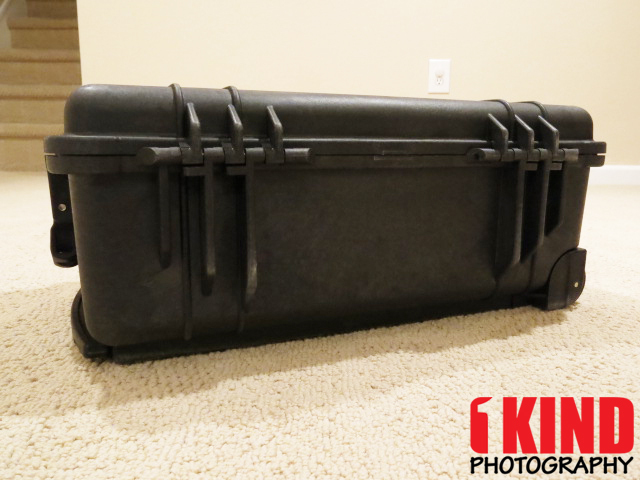 You can choose the Pelican case with Pick-N-Pluck foam or padded dividers. There's also interior lid cover pouches if you need more storage instead of the foam. I opted for the dividers because this offered more flexibility when the gear is swapped out for something different. The pluck foam offers a much more sturdier protection and less movement but if you ever change your gear, you'll have to buy new foam. An example, you have a telephoto lens like the 70-200mm f2.8 and you plucked the foam to conform to the lens. But down the road, you change your type of shoot and no longer need telephoto anymore and got all primes. You can't place the foam back. Once its removed, its gone for good. There are a few bulges on the inside of the case where the wheel and handle is on the edges. So you will lose some space but nothing much. In these areas, I would put all the little nit-nack stuff like batteries, chargers, memory cards, etc. Since the dividers are held in place with velcro, you can easily move them around. This isn't all my gear but pictured is a Canon 600EX-RT, Canon 24-70mm f2.8L II and a gripped Canon 5D Mark III. Attached to my camera is a Herringbone Heritage Hand Strap and a Luma Labs Cinch 2. 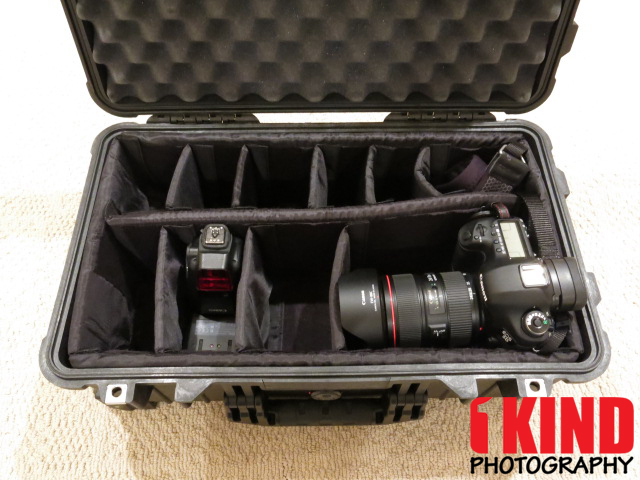 When it comes to gear, I want to make sure that it is able to accommodate gripped camera bodies. Yes, not everyone uses grips or professional camera bodies, which is why you see majority of manufacturers only show non-gripped cameras. 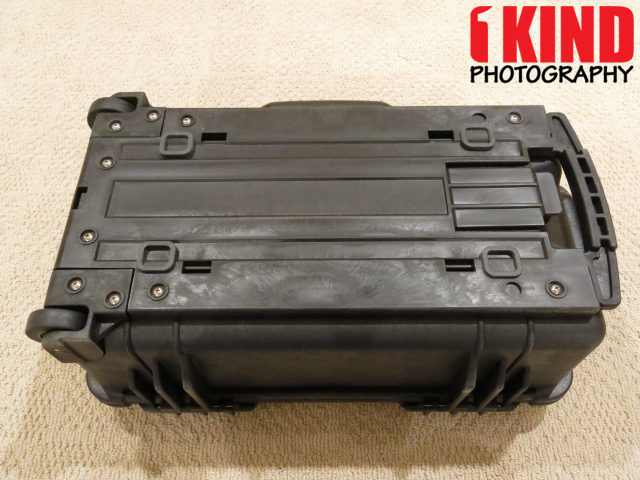 But if it can fit a gripped camera body, it can definitely hold non-gripped cameras and still have plenty of room. In the second (middle) image, you can see that with the lens attached, due to the camera body and hand strap, it's a bit side and pushes the center divider. This is fine if you are going to put small stuff next to the camera. If this doesn't work for you, you can detach the lens from the camera and store them in separate locations. You can configure the dividers to your likings. Conclusion : Overall, the Pelican 1510 1514 Carry-On Camera Case with Dividers is a must but if you travel a lot with your gear. The durability of the case is top-notch. The padding is nice, thick and provides plenty of protection. 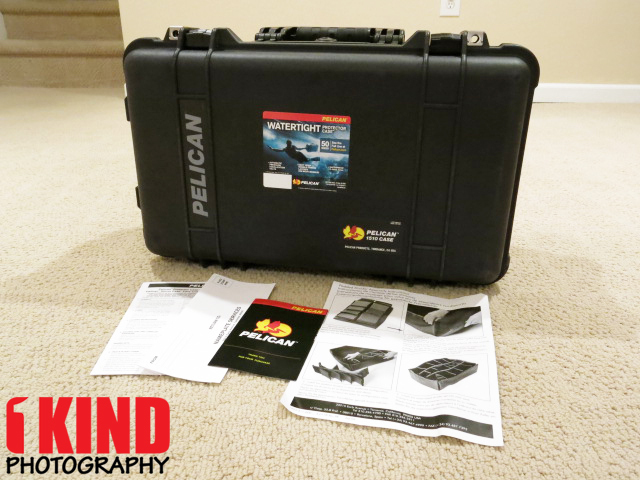 If you're looking for a durable case and it's made by Pelican, you know you're getting quality product.